It’s interesting to watch people change over time. I look at my daughters now, and wonder how they will turn out 10, 20, 30 years from now. When I was younger, I hated to write. Stick me in front of a stack of numbers, and I was happy as a clam – but ask me to do any type of writing, and I would just panic. To this day, I am still much more comfortable with numbers (or quantitative data), than I am with any other type of information – but there is a part of me that longs to write. It is a way to let things out in a non-obtrusive sort of way – to let some of the stress out that builds up throughout the day. Fortunately I have other healthy ways to deal with stress, but writing actually does allow me to cope in a way that I had never experienced before. Jealousy is a horrible word. It is horrible for so many reasons, but it has taken on a whole new meaning for me over the past several years. I have watched it destroy people – and for no good reasons what so ever. There is never any winning when jealousy is involved. It only ends up hurting people. And sometimes you can dig yourself into such a big hole, that there is no coming out unscathed. It is at those times that you wish you could turn back the clock – and remind the person how this could end. Maybe, just maybe that would resonate. Sometimes you just don’t know how good you have it. It is not just a horrible word, it is a horrible state. I have never been much of a jealous person, although I have definitely been guilty of food envy. Going to a restaurant is a little bit like opening a box of chocolates. You can look at the menu and read about the dishes, but until you get a chance to taste – you don’t really know what you are going to get. Macaroni and Cheese is a whole different story. 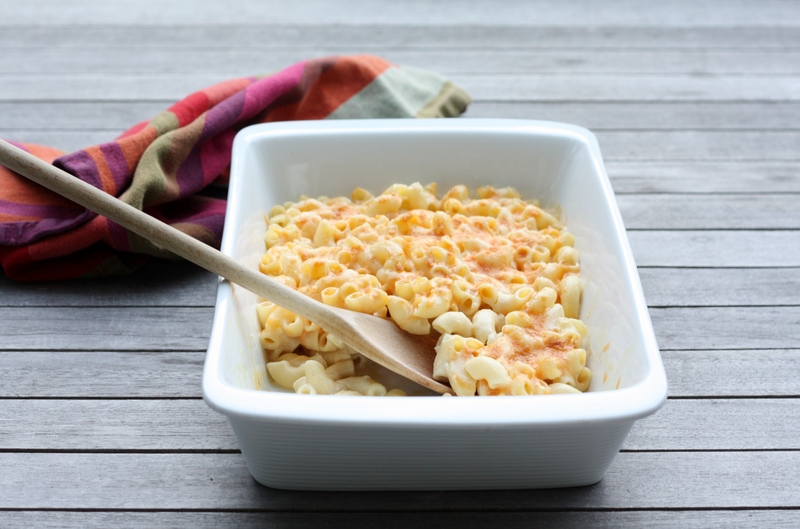 Seriously – when have you ever had a macaroni and cheese that you did not like? Ok – so as I write that, I can remember over the years eating plenty of mac-n-cheese that looked amazing, but when you actually took a bite it either had no flavor, was dry, or just tasted like someone melted some cheese over pasta. Now – just to keep it real, of course I have never turned away mac-n-cheese, even if it didn’t taste fantastic – but I will never give up finding that perfect mac-n-cheese recipe, and just when I think I have found it, I am sure there is another one out there that is even better. The other week while my husband was travelling, I decided it was time to try out a new mac-n-cheese recipe. One of my daughters is not a big fan of cream cheese, but I figured this might just change her mind. And boy did it ever. The girls thought this was hands down the best mac-n-cheese I have ever made. It was super creamy, flavorful, and worth every single bite – and the best part of all, it came from Cooking Light. So no need to ever have food envy with this recipe in your stash. And don’t worry, it feeds a big crowd – so no one else will have food envy either. It’s a win-win for everyone – and isn’t that the way life should be. Cook pasta according to package directions, omitting salt and fat; drain. Set aside. Heat a Dutch oven over medium heat. Add oil to pan; swirl to coat. Add garlic to pan; cook 3 minutes or until garlic is fragrant, stirring frequently (do not brown). Stir in 1 cup stock; bring to a boil. Cook 1 minute. Combine remaining 1 1/4 cups stock, milk, and flour; stir with a whisk until flour dissolves. Add milk mixture to garlic mixture, stirring with a whisk. Bring to a boil; cook 5 minutes or until mixture begins to thicken. Remove milk mixture from heat; add cream cheese, stirring until smooth. Stir in salt and pepper. Add cooked pasta to milk mixture, tossing to coat. Let stand 5 minutes. Pour pasta mixture into a 2-quart baking dish coated with cooking spray. Sprinkle cheddar evenly over pasta mixture. Broil 3 minutes or until cheese melts and begins to brown. Let stand 5 minutes.